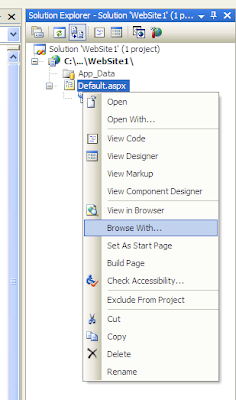 Did you know that you can configure Visual Studio to use Firefox when debugging your ASP.NET apps? Here's how it's done. 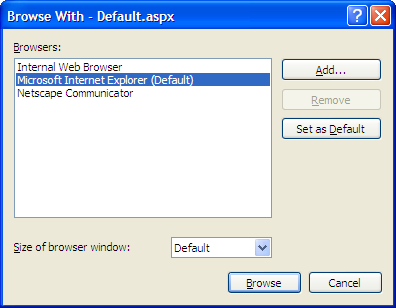 - Under the Solution Explorer, right-click on any ASPX file and select "Browse With..."
- Find "firefox.exe" and click "Open"
- Make sure Firefox is selected under "Browsers" and click "Set as Default". Close the dialog. Done! 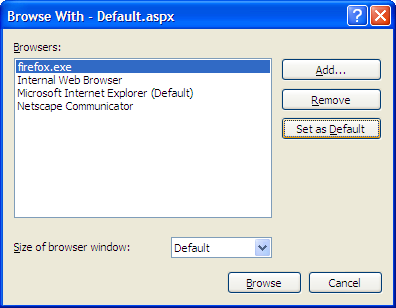 Now when you debug your ASP.NET apps, they'll launch in Firefox rather than Internet Explorer. "An error was encountered. Please return to the previous page and try again.". I've been looking for this problem on Internet but there's no result which makes me satisfy. Can you help me solve this problem? Thanks again. No, I haven't run into that problem. I always edit my config files manually anyway. For quick debugging try this..
Add Debugger.Break() into your code at an appropriate place. 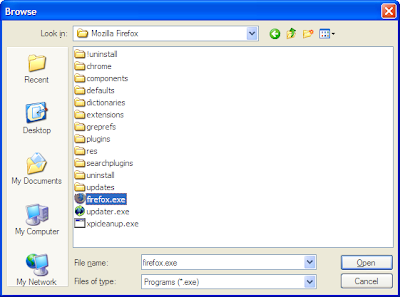 Browse to the page in firefox (via localhost) if on local dev machine? and the Visual Studio Just in Time debugger should pop up.. select the currently open instance of Visual Studio and you can step into the code where every you want without having to start from the beginning or jumping to cursor. Thank you very much...It help me a lot.